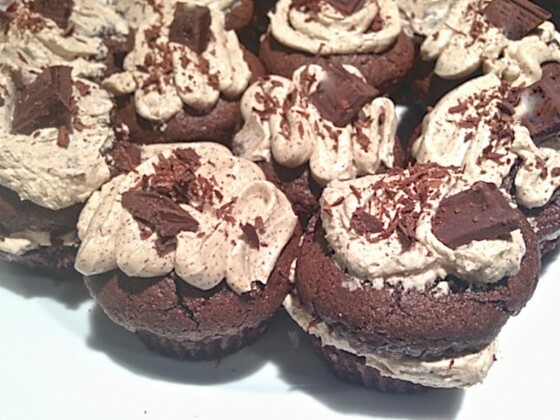 …plus how to make a cupcake into a whoopie pie easily! But first…. What makes a cupcake completely irresistible? 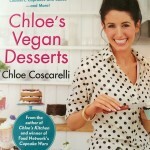 Chloe Coscarelli, winner of the Food Network’s Cupcake Wars, is quite an aficionado of all things in the competitive world of this little culinary art form–the cupcake. 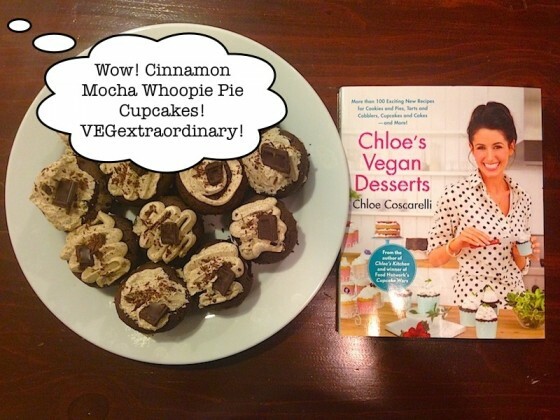 I received the cookbook, Chloe’s Vegan Desserts, as a delightful birthday present from my daughter, who picked out the recipe for Cinnamon Mocha Cupcakes and executed it in her own creative way, along with her co-chef. The recipe is basically the same but she switched up the way it’s frosted and decorated. They came out looking and tasting fabulous and would pass the above cupcake quiz with flying frosting colors! 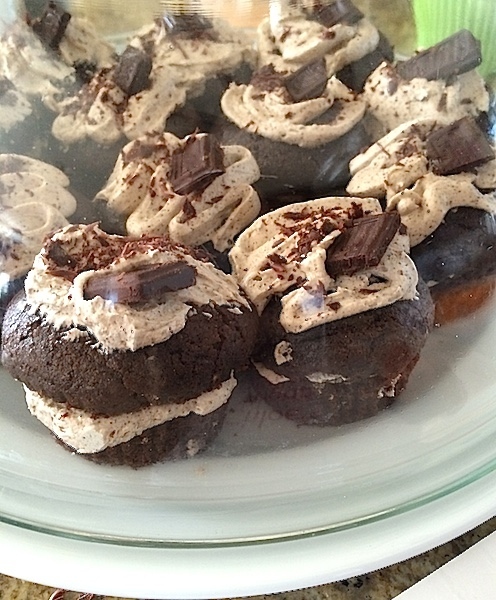 The original cupcake recipe is frosted on top, but in order to maximize the use of this freaking delicious frosting, Carly and Tyler cut the cupcakes in half crosswise and filled the gap with frosting too, creating the “whoopee Pie Effect!” Oh my! Preheat the oven to 350 degrees. Line a 12-cup cupcake pans. 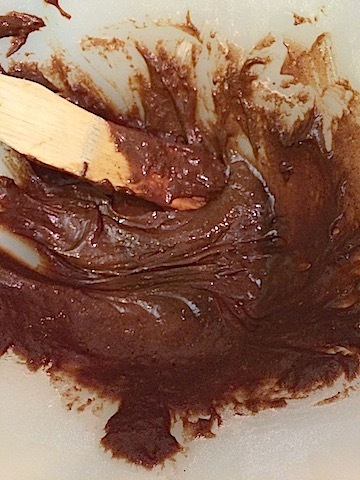 In a large bowl, whisk together flour, sugar, cocoa, baking soda, cinnamon and salt. In a separate bowl, whisk together coconut milk, oil, vinegar, vanilla and espresso power. Pour the wet mixture into the dry mixture and whisk until just combines. Do not overmix. Fill the cupcake liners about 2/3 full with batter. If there’s batter left over, divide evenly into each cupcake liner. Using a stand or hand mixer, beat shortening until smooth. With the mixer running on low, add powdered sugar and vanilla and beat to incorporate. 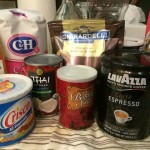 Add 1 tablespoon of espresso liquid at a time, as needed, until reaches desired frosting consistency and espresso flavor. Increase sped to high and beat for 2 more minutes until light and fluffy. When the cupcakes are fully cooled, carefully unpeel the cupcake liners, removing them completely. With a sharp knife, cut each cupcake in half. Fill a ziploc or plastic bag with frosting. Snip off a small triangle from one of the bottom corners of the bag. Squirt some frosting on the bottom half of each cupcake and spread that layer. Then carefully, place the top half back on each one. Squirt some frosting on the top of each cupcake in a decorative fashion. Place a chunk of chocolate on top as a garnish. Thanks for sharing! What a pity that the fat content is so high! 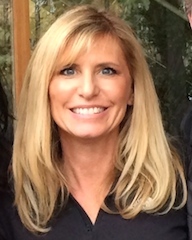 I’ve just heard a podcast by Victoria Moran about canola oil being refined so that its shelf life is longer. The producers don’t have to declare it. It is saturated fat 🙁 The same is true for coconut milk. If it is not freshly made, it is bad for the arteries. Some plant-based doctors believe any oil at all negatively impacts health. Desserts such as these should be eaten sparingly and with care. Ugh, who can resist?